A girl stands barefoot on a muddy walkway between rows of tent shelters, in the Bab Al Salame camp for internally displaced persons, near the border with Turkey, in Aleppo Governorate, Syria. The United Nations Office for the Coordination of Humanitarian Affairs (OCHA) has expressed serious concern for the estimated 300,000 people trapped in eastern Aleppo City, due to heavy clashes along the Castello road, the only road in and out of that part of the city. “Heavy fighting over the past few days has continued to put civilians at risk of death and injury while effectively cutting off humanitarian’s access to people in need of assistance,” a UN spokesperson told reporters today in New York. This follows intensified fighting by all parties to the conflict in Aleppo City and surrounding areas in recent weeks, including reports of airstrikes, shelling, and heavy clashes, causing many civilian deaths and injuries. It has also caused damage to schools, hospitals, and other civilian infrastructure, and hindered humanitarian aid operations. 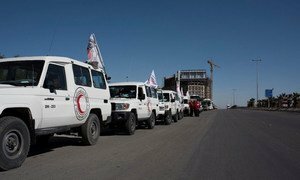 The United Nations humanitarian coordinator for Syria has expressed alarm over reports of deteriorating humanitarian conditions and urgent medical evacuation needs in the towns of Madaya, Foah, Zabadani and Kefraya, where more than 62,000 people are besieged.